The ice shelf edge of Thwaites, Antarctica’s most imperiled glacier, as seen by a NASA airborne survey in 2012. It’s no secret that Earth’s ice sheets are shrinking as temperatures rise. But this planetary meltdown isn’t just a problem for coastal residents dealing with rising sea levels. New research suggests it could be a problem for all of us as the effects of ice loss ripple through the oceans and atmosphere. Models published Wednesday in Nature explore how all the water pouring off the Greenland and Antarctic ice sheets could impact ocean currents, and how that, in turn, could affect the global climate. Antarctica and Greenland are already shedding ice quickly—the former has lost 3 trillion tons of ice since the early 1990s, the latter lost a trillion tons in just three years—but while the consequences for sea level are well-understood, the impacts on Earth’s climate as a whole, including the oceans, the atmosphere, and the remaining ice sheets, haven’t received much attention. To try and to fill this gap, the study led by Nick Golledge, a climate scientist at Victoria University of Wellington’s Antarctic Research Center, modeled changes to the Greenland and Antarctic ice sheet and the aforementioned knock-on effects under a high-carbon-emissions scenario known as RPC 8.5. The study identifies a slew of potential consequences of ice sheet melt that could ripple across the planet over the century. Those changes start with a basic physical reality: The freshwater pouring off ice sheets is less dense than the saltwater in the oceans, and so it floats. This forms a sort of cap over the ocean’s surface that prevents deeper warm waters from mixing with cooler surface layers, disrupting circulation. For waters off Greenland, the result is a slowing down of the Atlantic Meridional Overturning Circulation (AMOC) by as much as 15 percent over a 50-year period. Torsten Albrecht, a postdoctoral researcher at the Potsdam Institute for Climate Impact Research who wasn’t involved with the paper, noted that this would “add on top of the underlaying trend due to climate [warming]” Indeed, a study published last year inferred that the AMOC has already weakened some 15 percent since the middle of the 20th century. The AMOC system includes the Gulf Stream—a massive current that carries warm waters off the shores of western Europe, moderating the continent’s climate. A weakened AMOC would likely mean less heat for Europeans and more of it getting trapped in the Gulf of Mexico, where it can potentially fuel extreme weather events like hurricanes, Golledge explained. In Antarctica, the major oceanic impact of ice sheet melting is warm water becoming trapped beneath the Southern Ocean’s surface. While this causes air temperatures to drop in the researchers’ models, warming subsurface ocean waters gnaw away at the undersea parts of coastal glaciers, hastening their retreat. This could roughly double Antarctica’s contribution to sea level rise by 2100, according to the models. This is, of course, just a single study, and its predictions should not be treated as fact. Every model comes with its assumptions and limitations, as illustrated by a companion paper published Wednesday in Nature that throws some cold water on a catastrophic “ice apocalypse” scenario known as marine ice cliff instability (MICI). 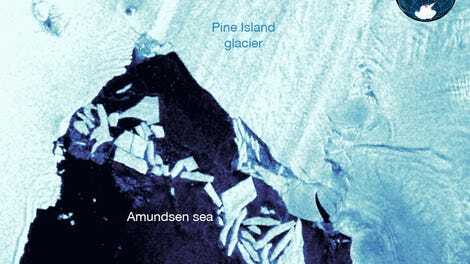 In this scenario, as warm water eats away at coastal glaciers from below, it creates taller and heavier ice cliffs that start collapsing like dominos. So far, MICI is a theoretical process borne out of one ice sheet model. The new paper, which used ice sheet model emulators to run thousands of simulations, didn’t find evidence to support its existence during past periods of Antarctic ice loss, like the mid-Pliocene 3 million years ago. 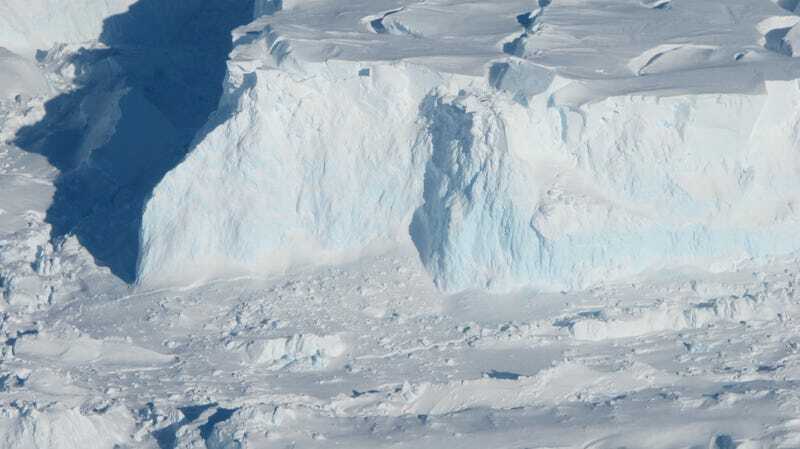 Without MICI, Edwards and her colleagues find it unlikely Antarctica will add more than 40 centimeters (1.3 feet) to Earth’s global sea levels by 2100, compared with earlier estimates of up to a meter (3.3 feet). So, a little good news for ice, but still plenty to worry about. Golledge told Earther that while the new ice melt paper focuses on this century, his group also ran some “stabilization scenarios” to see what happens to ice over longer timescales if we bring carbon emissions to zero.